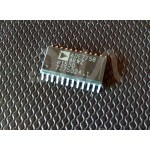 Buy online CS5460 Bi-directional Power/Energy IC in India at low price from DNA Technology, Nashik. The CS5460A is a highly integrated power measurement solution which combines two Analog-to-digital Converters (ADCs), high-speed power calculation functions, and a serial interface on a single chip. It is designed to accurately measure and calculate: Real (True) Energy, Instantaneous Power, IRMS, and VRMS for single phase 2- or 3-wire power metering applications. The CS5460A interfaces to a low-cost shunt resistor or transformer to measure current, and to a resistive divider or potential transformer to measure voltage. The CS5460A features a bi-directional serial interface for communication with a microcontroller and a pulse output engine for which the average pulse frequency is proportional to the real power. The CS5460A has on-chip functionality to facilitate AC or DC system-level calibration. The “Auto-boot” feature allows the CS5460A to function ‘stand-alone’ and to initialize itself on system power-up. In Auto-boot Mode, the CS5460A reads the calibration data and start-up instructions from an external EEPROM. In this mode, the CS5460A can operate without a microcontroller, in order to lower the total bill-of-materials cost. Energy Data Linearity: ±0.1% of Reading over 1000:1 Dynamic Range. Smart “Auto-boot” Mode from Serial EEPROM Enables Use without MCU. ADE7758 Energy Metering ICThe ADE7758 is a high accuracy, 3-phase electrical energy measurement IC w..
HLW8012 Breakout BoardHLW8012 Single Phase Energy Meter ModuleThe HLW8012 is a single phase energy m..